I’m sure you have had this happen to you before. You buy an awesome pair of jeans only to discover that the zipper won’t stay up once you start wearing them for an extended period of time. This is such an embarrassing problem and one that you usually don’t discover until you have been wearing the jeans or pants. I have an easy fix though and it requires NO sewing! 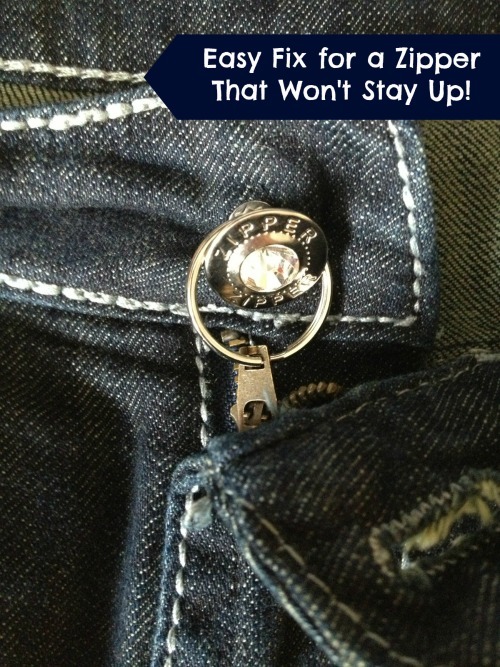 This fix for your zip is so simple and it will save a pair of jeans or pants from getting tossed! Take a key ring and slide it through the zipper pull on your jeans or pants. Attach it to your button, pull your zipper up. Fixed. I personally was so happy to find this fix as I had a really cute pair of jeans from Vault Denim that my aunt hemmed for me so that I could actually wear them. Then once I start wearing them I realized the zipper didn’t like to stay up. Not cool jeans. I’m so happy this fix worked! This is so great!!! Worked like a charm. Thanks for the tip! This is such a great idea, thank you so much! I’m sure I’ll be needing to do this soon although I already have come across this problem in the past. Thanks, you just helped me fix two pairs of pants!